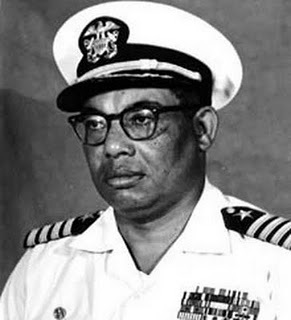 October 22nd in African American History - Samuel Lee Gravely, Jr.
October 22nd in African American History – Samuel Lee Gravely, Jr.
October 22, 2004 Samuel Lee Gravely, Jr., the first African American in the United States Navy to be commissioned an officer, died. Gravely was born June 4, 1922 in Richmond, Virginia. He enlisted in the Naval Reserves in 1942 and in 1944 successfully completed midshipman training, becoming the first African American commissioned as an officer from the Naval Reserve Officer Training Corps. His first assignment was to Camp Robert Smalls, a part of the Great Lakes Naval Training Station set aside for training African American enlisted men. In 1946, Gravely was released from active duty and he returned to Richmond to earn his bachelor’s degree in history from Virginia Union University in 1948. 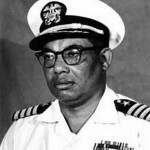 In 1949, Gravely was recalled to active duty and he went on to be the first African American to serve aboard a fighting ship as an officer, the first to command a Navy ship, the first fleet commander, and the first to become an admiral. Gravely retired from the Navy in 1980 with decorations including, the Legion of Merit, Bronze Star, Meritorious Service Medal, and Navy Commendation Medal. The USS Gravely and the Samuel L. Gravely, Jr. Elementary School in Haymarket, Virginia were posthumously named in his honor.